Camp is now in full swing. The low tones of the bass and drums ring through practice room walls as bands begin to find their sound. Students start to experiment with instruments foreign to them. Swapping the guitar for bass, trying the drums and playing around with guitar pedals are just the beginning in a long line of components to creating a stella jam. Our bands are well on their way considering 48 hours ago they didn’t even know each other. Being in a confined space, intensive program and working with such passionate people can cause disagreements, but as our counsellor Rachel Fannan has wisely imparted on us “No beef, no bad blood,” has become a motto as such for The Collective Sound. In an industry where people you thought you’d never see again pop up in the most unexpected places its crucial to have a positive attitude and much easier to be nice than to be nasty. Bands are gelling together really well this year, taking time to listen to each others ideas and working through tough decision making that comes with writing music. Last nights music video game has got students thinking of how to match their music with a visual stimulus. Often one of the more challenging aspects of camp is coming up with a music video idea that is original yet doable in a short space of time. This does although bring out creativity in people, under pressure is when diamonds are made, so planting the seed of video ideas early is key for preparation. Next week will be when the real work on music videos begins but for now we send our kids to sleep dreaming of melodies and rhythms. Silence. A concept not commonly paired with a music camp but today we explored that idea by attending a screening of the new film ‘In Pursuit of Silence.’ A friend of The Collective Sound, Brandon Vedder is a producer and cinematographer of the film and we were lucky enough to have him introduce the film to us before we watched it. After a week of writing and practicing songs, begin surrounded by constant noise it was insightful to take time to “take a step back, and then another step back, and then another and another.” Beginning with a live performance of John Cage’s 4:33, 4 minutes and 33 seconds of silence, each student was taken on a different journey through the film, some responding to the silence with laughter and others by looking inwards to how they view silence and its incorporation into their own lives. The cinematography in the film was beautifully crafted and students sat in awe upon its conclusion. A big thank you to Brandon Vedder, Patrick Shen, Andrew Brumme and Cassidy Hall for such a thought provoking film. 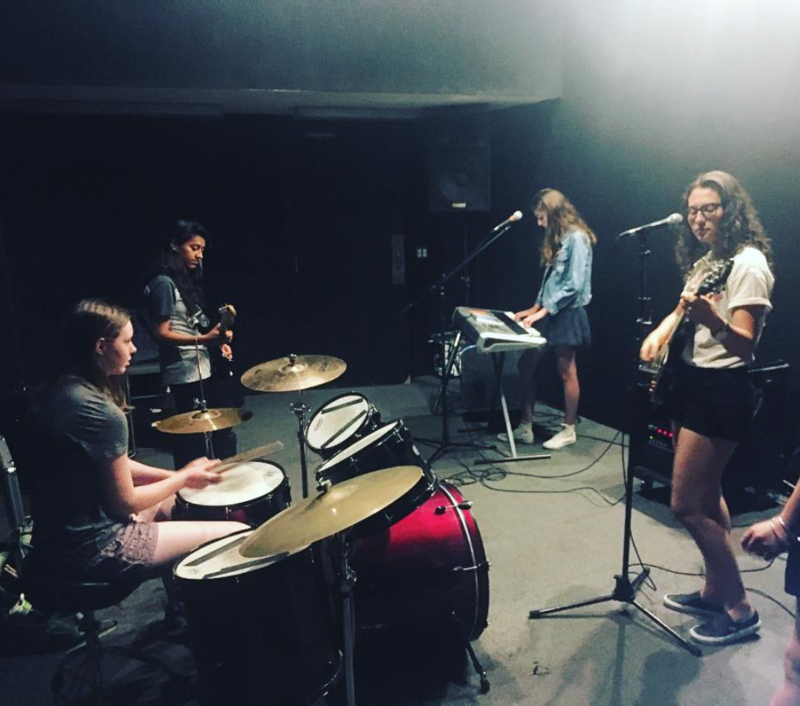 Back to Costa Mesa and bands have now written their songs and are getting amped for recording and filming music videos next week. The weekend also comes with great anticipation, with a trip to LA and a beach hang out planned. Something we like to do a lot here at The Collective Sound is watch other bands and artists perform. Saturday saw us discuss our views on last nights film, most of the students commented on how much the content of the film made them think about what silence is to them. This then quickly turned into a debate about what is ‘music’ or ‘art.’ What constitutes something from nothingness to art? A question that we concluded was purely subjective. Down time is also important to recuperate and rest before the rest of the days events so we headed back to the dorms for a couple of hours. Off to LA we headed to Chinatown’s Summer Nights, were we saw an array of talented artists. Our favourite has to have been the incredible Yip Yops, a band from Cochella Valley made up of teenagers with outrageous stage presence. Many campers brought albums, records and stickers to support the band, which we were then able to get signed when we meet the band. Thanks Yip Yops for taking a moment out of your busy schedule to speak with us, we definitely learnt a bunch and are incredibly inspired by you. Sunday saw us discuss music video concepts after watching examples from our favourite bands. Then to the beach where we had an epic water fight, battling it out between teams and finally into the ocean to body surf and wave jump. As the sun set we enjoyed fresh grilled burgers and a toasty camp fire with a sing along before a much needed rest to jump us in to week 2!